Home » Posts tagged "chemical weapons"
By most accounts, both ISIS and the Syrian Armed Forces are using makeshift chlorine weapons for dramatic effect — though not necessarily for battlefield utility, as they are difficult to use effectively in improvised explosive devices. The weapons referred to above, as summarized here, are the really old rusty ones from before the first Gulf War. However, while largely unusable as intended, some of the ingredients in them can be re-purposed into IED additives. Additionally, chlorine (which was not discussed in the major Times investigation) is not just used in weapons and is thus far more readily available as an ingredient than other chemical weapons agents. 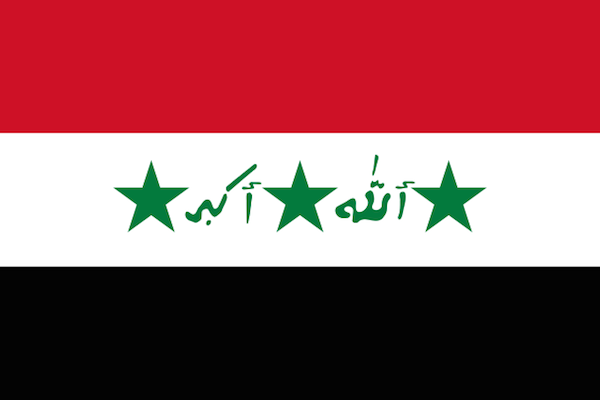 Other minor ISIS chemical IED attacks in Iraq have also been reported. There are also allegations that ISIS used some other type of chemical agent in Kobani. The Britain-based Syrian Observatory for Human Rights said […] The rebels stormed parts of the base before a counterattack and intense air raids by government forces pushed them back, it added. The group said that some Islamic State fighters had breathing problems in the area after government forces used chlorine gas against them. Chlorine, while quite lethal in its own right, is a very different (and somewhat more survivable) agent from the sarin nerve gas weapons used by the pro-Assad forces on civilians in August 2013. While the sarin stockpiles are being declared to global inspectors and relinquished, the regime has allegedly continued to drop improvised chlorine-infused barrel bombs from fighters jets to intimidate northwestern villages several times in early 2014. Chlorine barrel bombs are nowhere near as “effective” (i.e. massively fatal) as conventional weapons or regular chemical warheads like those used in March and August 2013. Regardless, it sounds very much like both ISIS and the Syrian Armed Forces are using makeshift chlorine weapons for dramatic effect (though not necessarily for battlefield utility) — and now one is simply using it on the other. Not a lot of tears will be shed for ISIS fighters exposed to what is essentially their own directly proportional chemical comeuppance. A huge new report from the New York Times examines how the U.S. military and government systematically mishandled and covered up pre-1991 chemical weapons found in Iraq after the 2003 invasion. Thousands of chemical weapons were eventually found in Iraq after the invasion, only they were all from the stockpiles the West had provided before Saddam Hussein got on their bad guy list, so the Bush Administration suppressed the discoveries (and dangers to troops) to avoid embarrassment, since it wasn’t an active and rogue program after all, and they didn’t want to admit our troops were being harmed by US-designed/European-made chemical weapons. Because the aging weapons actually supported the case that no new weapons had been produced after 1991, the information was concealed from ground troops who weren’t expecting to stumble on them, military doctors trying to treat the troops, Congress, and everyone else. Troops were regularly ordered to deny having found active sarin and mustard weapons, and medical staff were so unprepared to handle cases that they often tried to deny exposure had occurred. One sergeant even had to look up his symptoms online to confirm it had been mustard gas. That lack of attention has continued. The main area of remaining caches fell to ISIS earlier this year; though the weapons are generally unusable in intended form they have previously been repurposed successfully by insurgents in roadside bombs and booby traps. 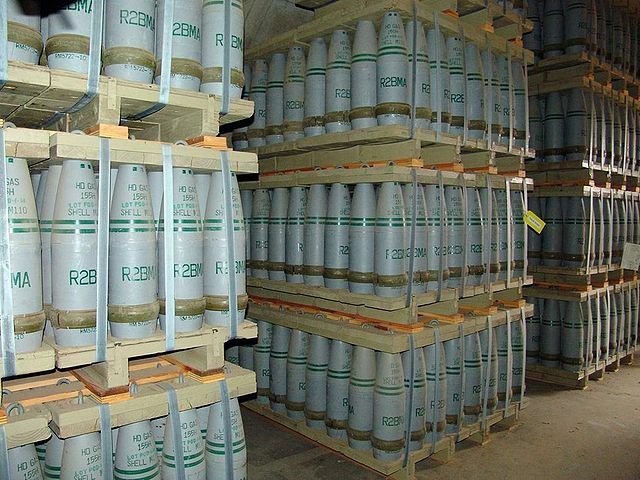 Pallets of 155 mm artillery shells containing “HD” (distilled sulfur mustard agent) at Pueblo Depot Activity (PUDA) chemical weapons storage facility. (Credit: US Army via Wikipedia.) Similar shells, made in Europe before the first Gulf War, were found in Iraq by US forces. 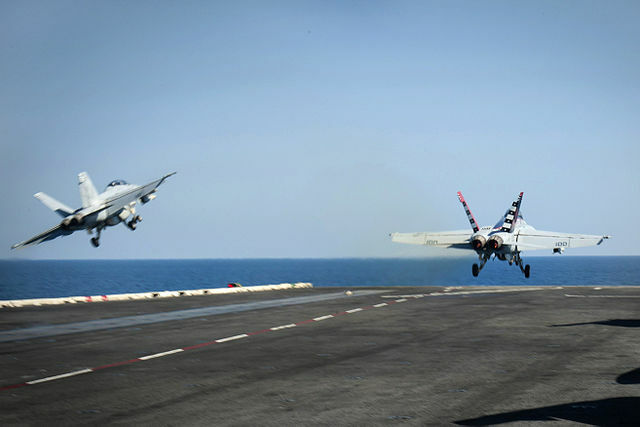 Is the US trying to build a new case for war in Syria? Gen. Martin E. Dempsey, the chairman of the Joint Chiefs of Staff, said Thursday afternoon that it would not be possible to defeat the Islamic State in Iraq and Syria without attacking its fighters in Syria. General Dempsey, speaking at a news conference with Defense Secretary Chuck Hagel, did not commit the United States to carrying out airstrikes in Syria, and the Obama administration’s broader strategy for defeating the Sunni militant group remained unclear. Although I think it’s fair to say that acting against ISIS in Iraq only would not really defeat or destroy them, I also don’t think that’s an automatic case for escalating to jump into the mess in Syria. The policy so far has been a sort of updated version of the Cold War “containment doctrine,” but taking the further step of intervening in Syria (rather than just Iraq) would be a bit like the U.S. trying to contain the spread of communism into South Vietnam by attacking North Vietnam from the air. On paper, it may have made logical sense (cut the external support, contain the threat outside the borders), but we never really had a coherent plan there either — since we didn’t invade the north and we never really committed to toppling the regime or replacing it with anything — and look how that turned out. I’m sure they think it’s a similar situation and therefore also shouldn’t be done piecemeal (like Vietnam was, which bled us out). But going into Syria at all opens the door to having to go in completely. Containment requires enough energy on its own without having to go the extra mile of ending the threat everywhere and filling the vacuum it leaves behind. I’m particularly frustrated by the fact this is coming up again, given that members of Congress and the US public (as well as the UK parliament and British public) made very clear last August and September that they were not interested in getting U.S. forces directly involved in Syria’s civil war. On top of today’s pronouncement by Dempsey, there were claims last weekend by Syrian rebel leaders who oppose both ISIS and the Syrian government that the US had asked them to try to drum up global support for U.S. military actions in Syria. Which, combined with the official outrage over the beheading of an American photojournalist, makes this all sound like a manufactured government effort to whip up public outrage and by extension support for military actions the public rejected a year ago. In other words: if at first you don’t succeed (in rallying public support for illegal, unilateral involvement in a quagmire by choice), try, try again … 365 days later. Investigative journalists at BuzzFeed put in a lot of hard work (and Freedom of Information requests) to uncover hundreds of deeply dubious authorizations last year for the sale and export of dual-use weapons to Turkey immediately following a violent government crackdown that began in late May 2013. The crackdown and clashes with protesters across the country resulted in the deaths of at least 11 people and injuries to literally more than 8,000 others. The authorizations for the sale of controlled goods were made at a high level and almost no requests were denied despite the unfolding repressive response to the protests. 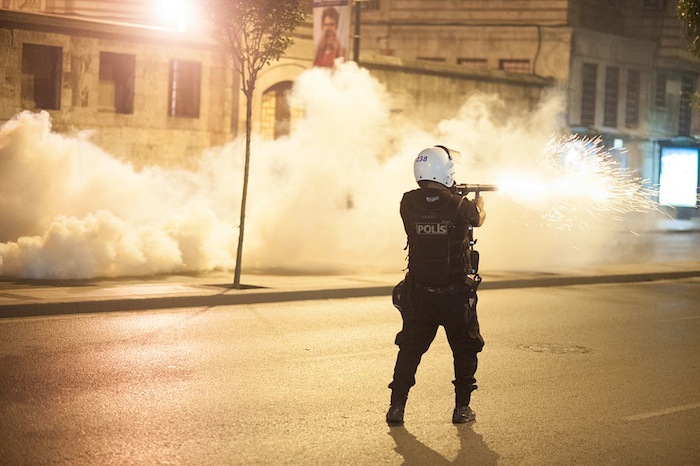 It’s not unusual for the United Kingdom, the United States, or other manufacturers of advanced military and anti-riot hardware to sell to questionable governments — indeed there was heavy criticism that many of the tear gas canisters fired at protesters during the Arab Spring several years ago said “Made in the U.S.A.” in big letters. And it’s also likely true most of the hardware being sold to Turkey last year was indeed for military use, rather than law enforcement use. That would separate it from the government and police, whose response last year was more or less separate from the erstwhile rivals in the Turkish Armed Forces. But a lot of it falls under the “dual-use” header, which means it could be used for a “legitimate” purpose but could also easily be used for a repressive or illegal purpose. And, either way, selling it during and immediately following a crackdown (especially in a state where the military violently seized power as recently as 1980 before several more less successful attempts) seems like poor decision-making. Nearly a year into the brutal Syrian Civil War [in 2012], the British coalition government somehow decided to issue a license for a UK firm to export to Syria the chemical components used in sarin gas manufacturing. To a regime known to hold chemical weapons. In the middle of a civil war. The exports were only blocked by external, EU trade sanctions added 6 months later. Granted, authorizing the sale of “dual-use” components that can be used to make chemical weapons, to a regime with just such a stockpile in the middle of a civil war, is an order of magnitude less explicable or justifiable than the Turkish deals. And the UK government probably believes that there is no reason for it not to authorize weapons exports to a fellow founding member of NATO, Turkey, which is (a bit) more reliable than neighboring Syria. Assessed thoroughly? If circumstances change, licensing decisions are reviewed quickly? And the best part of that story is of course that the same UK government is trying to renegotiate its membership in the European Union before holding a deeply misguided referendum on whether or not to leave altogether. Once outside the EU, I suppose, the United Kingdom will be free to export as many weapons to questionable states on the other perimeter of Europe to its heart’s content. I’m sure Thatcher would be proud.